The Indian Railway Catering and Tourism Corporation (IRCTC) seems to have got quite aggressive with partnerships over past few months. After their recent partnership with Paytm, they have now partnered with MyDala.com, a startup that provides deals and offers across various categories. 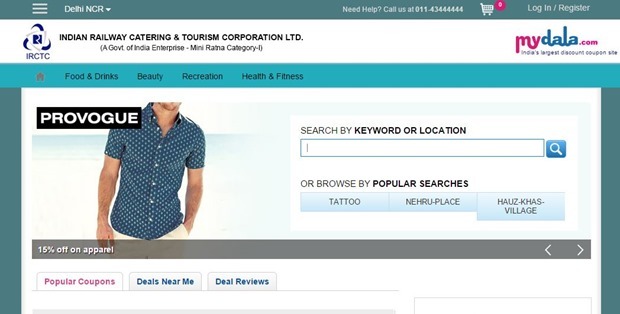 IRCTC has launched a new microsite at , which will offer deals to travelers who book tickets on IRCTC portal. While this deal will open up a huge pool of users to MyDala, we are not really sure how IRCTC plans to benefit from it, or what are the monetization plans. The new integrated portal is an extension of main MyDala site, but with IRCTC branding at the top. The deals offered to IRCTC users span across various categories including Food & Drinks, clothing, beauty & fitness and recreation deals. Like IRCTC did with Amazon, they have provided a separate “MyDala Deals” tab on IRCTC homepage that will let IRCTC users know that the they can avail of deals. Railways minister had hinted us during the Union Budget earlier this year that they will be modernizing IRCTC and all these tie-ups seem to be part of this plan. Over last few months IRCTC has made multiple partnerships including with Amazon for eCommerce and Paytm for payments. IRCTC has also newly launched Concierge/Cab services, E-Catering and ticket booking for popular heritage sites like Taj Mahal. They have also expanded beyond trains, and have now started offering Mumbai Darshan by Air on Helicopters! Apart from this, IRCTC recently partnered with BookMyTrain.com to offer travelers Cash-On-Delivery facility for train ticket purchases, where users can book the tickets and then pay for them when they are delivered at their door-step. Overall, IRCTC looks really intent on revamping their not-so-travel-friendly image to a more travel-friendly one! Foxconn To Re-Enter India, Your Next iPhone May Be Manufactured in Maharashtra! Super!!! I regularly use IRCTC to book tickets but I was sad that there were no offers. Hope it works with MyDala now. Thanks for sharing!